Presidential Election Night, November 8, 2016. It will be a Politically Liberating Event for many of us whatever the outcome. Throughout the evening, we will be looking at our clocks and watches and waiting for the Electoral College Vote Number 270 to resound across the media and give us the top-of-the-ticket winners. But can you name another Political Liberating Event 27 years ago that culminated at the stroke of 12:00 midnight on November 9, 1989, the night after our current political campaign will be decided? Six words tell it all: THE FALL OF THE BERLIN WALL. The two events are why I'm writing this. It's only the 2nd time that I've written a post that linked watch design to a major political event with international repercussions. I did so in January 2015 for the Charlie Hebdo massacre as well. So it's high time for another historically important remembrance -- Since building a WALL started Donald Trump's ascendancy as a political candidate. This time my commentary is to remind readers of Nomos' 2009 wall-downing, celebration model that the watchmaker released to commemorate the Berlin Wall's Fall. First the Berlin Wall's history, so crucial to Nomos' original, 2009 design context. If you were born in 1989, then you may not know any of this. That's the year the B-Wall came down and reunited East and West Berlin, defacto reuniting Germany. If you were born in 1961, when it was erected, then you may know a bit more. You were living when it was a stark reality. That's when the B-Wall wall went up. The B-Wall was a world-wide symbol of Communist oppression for 28 years. Physically, the B-Wall was actually two, eight foot high concrete barriers strung through Berlin. It ran for 28 grim, gray miles. 75 People were killed trying to cross it from the East to the West. On November 9, 1989, Dan Rather began his CBS Evening News broadcast by saying, "The Berlin Wall is still standing, but it doesn't stand for much." He ended that broadcast by saying, "The Berlin Wall is obsolete tonight." The company Nomos is based in Glashütte, Germany (in the eastern part of that country). It was founded in 1990 only two months after the fall of the B-Wall. 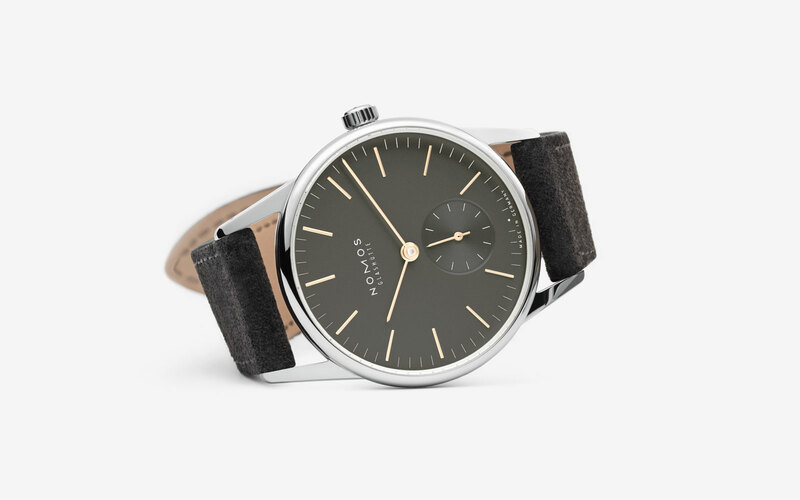 A relative upstart in the long history of watchmaking, Nomos is now advertising internationally and has outstanding watches at affordable prices. Its hallmarks include a variety of models with subtle dial designs, high quality movements and rich wrist wraps. The look is simple yet elegant and undeniably recognizable. That's why the Nomos' Orion 1989 November Gray introduced in 2014, the 25th Anniversary of the B-Wall Fall is a watch that especially today Politically Reminds us of the Importance of freedom from government oppression, the Importance of freedom to vote and the Importance of defending democratic principles. Orion 1989. Commissioned for the 25th Anniversary of the fall of the Berlin Wall. Image from the Nomos' Website. Our Time Should Remind Us that In our Democracy, Walls should be Obsolete.